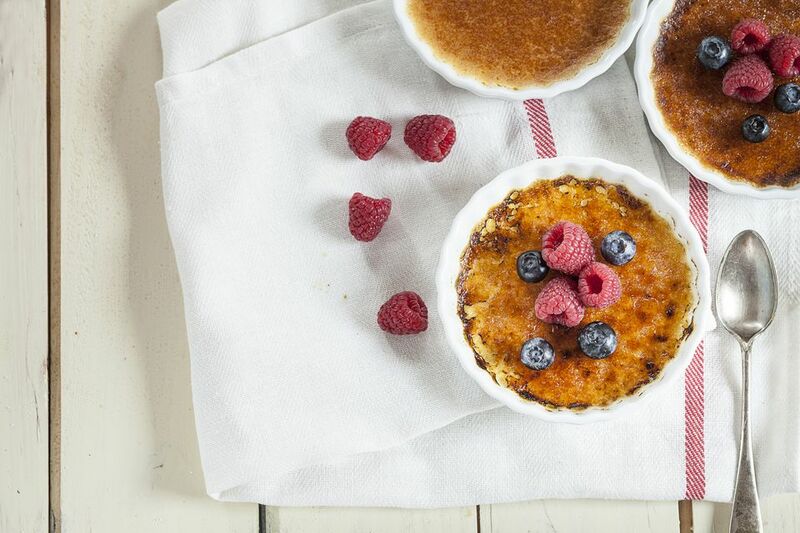 Now that you've got the crème part down, it's time for the brûlée — which means "burnt" in French. You'll be using a butane culinary torch for that. Familiarize yourself with how your particular model works and be sure to follow the safety instructions — you're playing with real fire here! 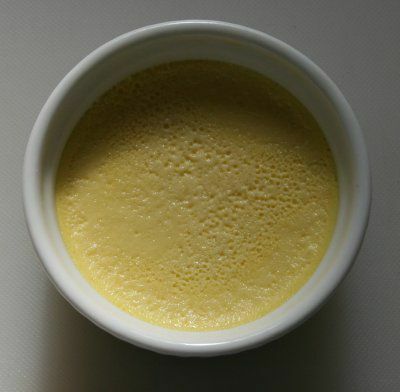 Your completed custards have chilled for at least four hours, but overnight is best. About 20 minutes before you want to caramelize them, take them out of the refrigerator and let them sit at room temperature. If any moisture condensation has formed on the Creme Brulee tops, gently dab it away with a paper towel, being careful not to dent the custard. Then sprinkle the tops of the Creme Brulees with granulated white sugar. Be generous — you'll pour off the excess in a moment. But make sure you cover the whole surface and swirl the ramekins to distribute the sugar evenly. Here's a tip: When you pour off the excess, pour it onto the next Creme Brulee, adding new sugar with a spoon as needed until all the Creme Brulees are covered, but there are no loose granules remaining. Now the fun starts — it's time to fire up your torch! They all work differently, so follow the instructions for lighting yours, and adjust the length of the flame to medium. Hold the torch a good distance away from the Creme Brulee and slowly move it closer, while sort of rotating the flame, keeping it constantly in motion. Once it gets close enough, you'll see the sugar start to liquefy and form little droplets on the surface. As you continue cooking the sugar, you'll see little wisps of smoke puff up as the sugar begins to turn caramel-colored. You'll also smell the delicious aroma of cooked sugar, kind of like cotton candy. Keep the flame moving so that it isn't focused on any one spot for too long. Pull the torch away if the sugar smokes excessively. Be sure to get the sugar along the edges of the ramekin as well as in the middle. You'll be seeing a nice, caramel-colored glaze form on top of the Creme Brulee. It's a bit tricky knowing exactly when to stop, but it's better to stop too soon than too late. If necessary, you can always fill in any underdone spots in a minute, when the sugar cools down a bit. When you're finished you'll have a hard, glass-like glaze of caramelized sugar on top. Pop the Creme Brulees back into the refrigerator for 10 minutes or so before serving them, just to re-chill the Creme Brulees after they've been heated by the torch. You can serve the Creme Brulees just as they are, and they'll be absolutely delicious. But a few fresh berries and a dusting of powdered sugar is a nice, elegant touch. Are You Measuring Your Ingredients the Right Way?